Teaching about the Triangle Fire and related topics? Find selected educational resources, including lesson plans and online materials, as well as Triangle fire learning projects contributed by teachers and students here. Andi Sosin updates this page about teaching about the Triangle Fire and related topics. Please contact her or access the Triangle Open Archive (for online capture of documents, photos, audio or video) to submit artifacts and share resources; we’ll spread the word! 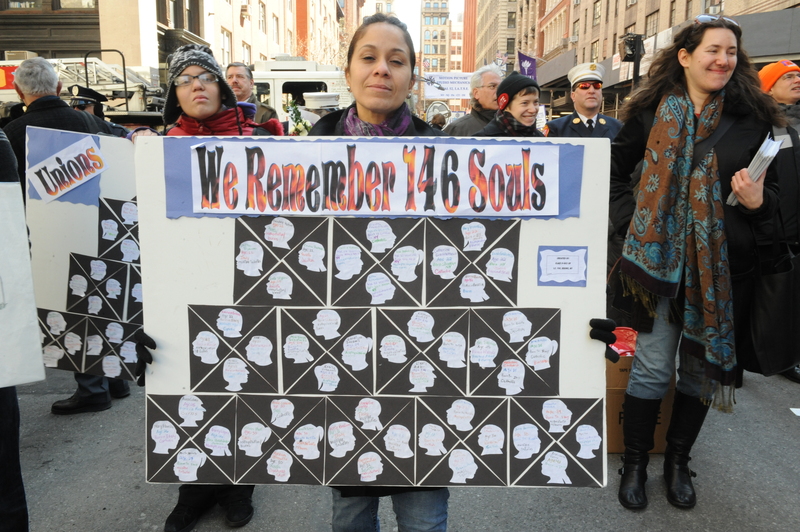 Caroline Roswell from PS 229 in Woodside attends the annual 2015 Triangle Shirtwaist Factory fire ceremony in Manhattan with her 5th-graders, who wrote essays about the tragedy and donned period clothing to evoke the workers who perished in the 1911 fire. Image courtesy of the New York Teacher. Let’s hear it for the youth! Two high school freshman are building a Triangle Fire informational website for the 2014 National History Day competition. Thank you Quinn Wandalowski and Julia Thomas for remembering the Triangle Workers! Good luck! Click here to see their project website. Want to be inspired??! Check out the video above of the wonderful folks at NYC’s very own Neighborhood School as they chalk, sing + call the names through the day of the 2014 Triangle Fire Commemoration! Thank you: Vivian Sorenson, Gary Meister, Debra Granik, JJ Lask, John-Carlo Monti, Denise Soltren + Marjorie Ingall. The Jewish Women’s Archive Lesson Plan: What Will It Cost Me to Work for You? Jews and the Labor Movement: Immigrant Life on the Lower East Side, the Strike of 1909, and Garment Workers in Peril Yesterday and Today by Judith Sandman, 2013 Twersky Award winner, designed for Jewish students in grades 6-8. BREAD & ROSES has published a new curriculum guide: The Great Strike, Lawrence, Massachusetts, 1912. Small Planet Communications, Inc., in partnership with the Lawrence History Center, has developed a comprehensive curriculum for teachers and students on the historic textile strike that took place in Lawrence in 1912. For copies and information, contact Lisa Lyons at Small Planet Communications, lisa@smplanet.com, 978-794-2201 ext. 2003. The American Society of Safety Engineers (ASSE), a group of occupational safety, health and environmental professionals offers resources regarding safety, including Napo, an animated character who educates about safety in the workplace. The New York Times Learning Network. 100 Years Later: Examining the Impact of the Triangle Shirtwaist Factory Fire, by Shannon Doyne, Holly Epstein Ojalvo and Katherine Schulten, March 25, 2011. Fire in the Sky:The Triangle Shirtwaist Factory Fire Causes and Consequences by Christopher Czajka, online at the National Teacher Training Institute Channel 13 PBS keys to New York (Episode 4 of the Ric Burns Documentary) with media literacy activities to develop awareness of labor conditions and the causes and consequences of the Triangle Shirtwaist Factory Fire. Worker Safety – The Triangle Fire Legacy by Patricia Bonner. Council for Economic Education: An EconEdLink Online lesson. 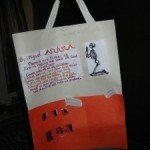 Includes worksheet activities and website resources. The link to the answer key is EconEd It Could Happen Today Worksheet AnswerKey. The Triangle Fire: A Curriculum Guide. Washington Post Newspapers in Education. Type “Triangle Fire” in the Search bar. Interview with David Von Drehle with an activity about how important cutters were to the process of making shirtwaists (a 5MB pdf; worth the wait). Von Drehle also appears on C-SPAN Booknotes. The Triangle Fire: From Industrialism to Progressivism by Joanne Reitano, La Guardia Community College CUNY; The American Social History Project: An Investigating US History module designed for use in the introductory college U.S. history survey course. Many schools and teachers have engaged their students with inquiry learning projects about the Triangle fire. Presented here are some of the projects submitted to the Coalition, including videos, audio plays, photos of artifacts, and written documents. Harris Cohen, a student at Hunter College Elementary and High School in New York City entered his website project about the Triangle Fire and taking a stand for Workers’ Rights in the 2017 National History Day competition. While he unfortunately did not make it to NHD, he says “I had a very meaningful experience researching the Triangle fire. If you would like to look at my website the link is http://20550648.nhd.weebly.com.” Take a look! Congratulations to the students at Ramon Cortines High School in Los Angeles who presented an oratorio they composed, titled, “Woman at the Window: The Triangle Factory Fire,” on February 4th and 5th, 2016. Students at Northwood High School, Huntington Beach CA, remember the Triangle Fire. We commend them! Read more about Northwood High School’s production here. Congratulations to Molly Brambil, Megan Healy and Caitlin Yabroudy from Huntington Union Free School District on earning 1st place in New York State in the 2013 National History Day Competition senior website category for their outstanding historical work and high tech presentation of the Triangle Shirtwaist Fire and its impact on workers’ rights. They also earned the Best Entry on Labor History as designated by the American Labor Studies Center. The trio will next represent Huntington and New York State at the national-level competition to be held on the College Park campus of the University of Maryland in June. Students from J. Taylor Finley Middle School in Huntington, NY traveled to Manhattan to participate in the the 101st commemoration of the Triangle Factory Fire. 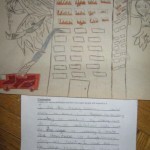 In order to qualify for the trip, students wrote essays explaining the events that preceded the fire and the impact the tragedy had on labor in America. Hope High School in Providence RI produced a costume play that is headed to the Fringe Festival in Edinburgh, Scotland. Juan Morel Campus Schools participated in the Centennial. Here is a newsletter written by the students. 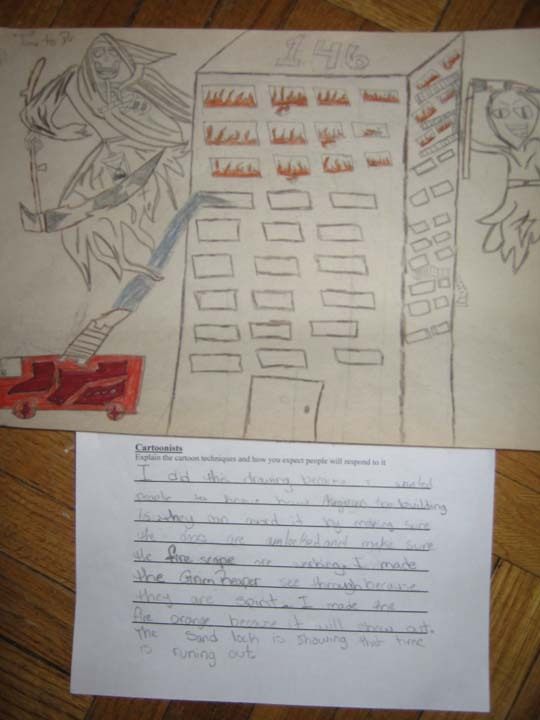 Maribeth Whitehouse , a teacher at IS 190, Bronx, NY sent photos from an 8th grade class project that linked the Triangle fire to the HappyLand fire of March 25, 1990. She says “Although there are obvious differences between the two events, there are many similarities like building code violations, the impact on immigrant populations and the huge loss of life (especially young people).” Here are photos of posters and writing by two of the students in the class. Maribeth’s students have just created a new audio play, in which they conduct a rally as if it were 1909. Whitehouse Students imagine a 1909 Worker’s rally. Maribeth and her students came to the Centennial ceremony on March 25, 2011. 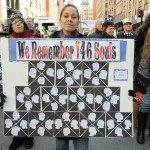 Here is a picture of a poster they made to remember the victims. Teacher Caroline Roswell of PS 229 Queens led her students in an inquiry project that took them to the Evergreens Cemetery, where they presented their reports and read garment workers’ contemporaneous accounts of the Triangle fire at the unveiling of a memorial to the formerly unidentified and now known victims, at the Longman Memorial, on April 5, 2011.